Supplied as a liquid in PBS, pH 7.2. Small volumes of anti-GNRPX antibody vial(s) may occasionally become entrapped in the seal of the product vial during shipment and storage. If necessary, briefly centrifuge the vial on a tabletop centrifuge to dislodge any liquid in the container`s cap. Certain products may require to ship with dry ice and additional dry ice fee may apply. Expressed in testis and liver. Suitable for use in Immunofluorescence and Western Blot. Western Blot analysis of PLEKHJ 1 expression in transfected 293T cell line using MBS6004530. Lane 1: PLEKHJ 1 transfected lysate (16.39kD). 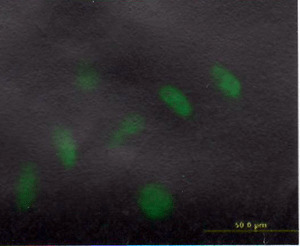 Immunofluorescence of HeLa cell using MBS6004530 (1 Oug/ml). NCBI/Uniprot data below describe general gene information for GNRPX. It may not necessarily be applicable to this product.